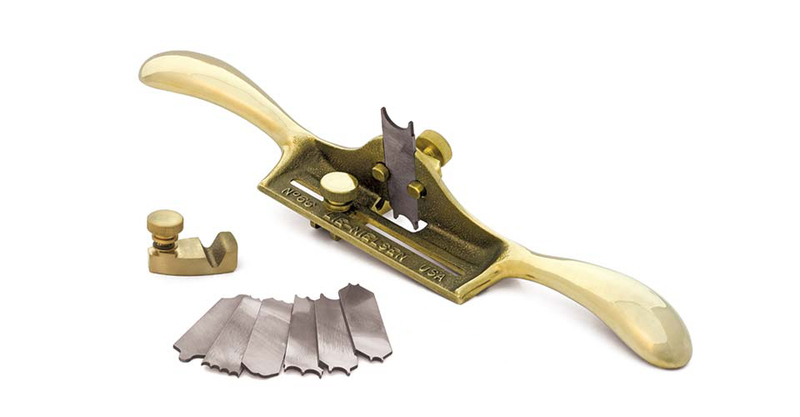 This Bronze Beading Tool can quickly produce a wide range of decorative profiles without the fuss and fiddle of setting up an electric router. Derived from an early, generously proportioned Stanley No. 66, it has a polished cast Bronze body and Brass blade clamp. Two fences are included, one for curved work and one for straight work, and can be adjusted along the slot across the bottom of the tool. The Beading Tool comes with a double-ended 1/8" and 1/4" router blade and seven double-ended blades with 14 different profiles for beading, reeding, and fluting. Also included is a double-ended blade blank that can be worked with files to make your own shapes, which makes quick work of reproducing small pieces of molding for repair or restoration. Blades are 5/8" wide x .060" thick and made from hardened, A2 Tool Steel. Will also fit the antique Stanley No. 66. 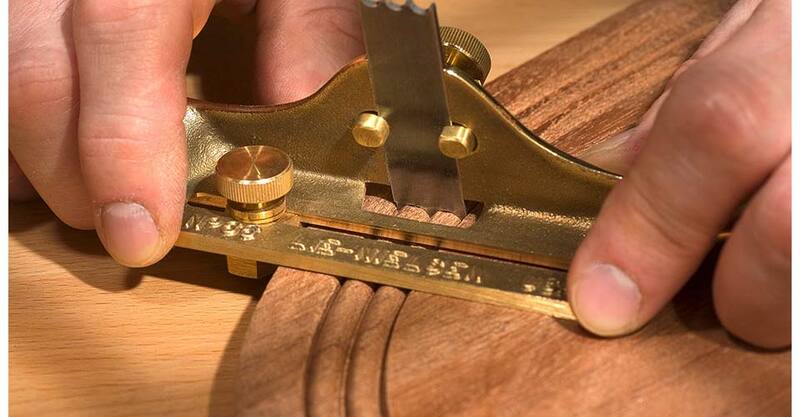 Although the modern electric router is a universal and useful tool, many woodworkers will find the Beading Tool handy and fun to use for making a wide variety of decorative moldings, beading, reeding, fluting and routing with a minimum of fuss. The blades will fit antique Stanleys as well, for those who have or acquire one without blades. The set of blades consists of 7 double-ended blades with a total of 14 shapes, plus a double-ended 1/4" and 1/8" router blade. Also included is a double-ended Blade Blank. The blades are made of A2 tool steel hardened to Rockwell 60-62. Each blade is designed to work as a scraping blade — generally while pulling the tool, though at times pushing will seem most comfortable — to remove a small shaving per stroke. In some cases, the larger shapes will work best if you lower them in the clamp as the work progresses for maximum rigidity. The blades — except the routers — should be sharpened by stoning the flat. Only rarely will work need to be done on the shape itself, with slipstones. The Blade Blanks are not hardened, and may be worked with files to produce various shapes. The Blanks are hard enough to last a reasonable amount of time without heat treating. The Beading Tool comes with a straight fence, which is used for most jobs, and a curved fence which is used when the edges of the work are not straight. Both are adjustable in the slot across the width of the bottom of the tool. We use Manganese Bronze for the bodies and fences. Other parts are Brass. The castings are fully stress relieved, a process that removes inherent stresses. Polish the Bronze parts with any good Brass polish, or enjoy the patina that develops with age and use. Oil the blades to prevent rust. We recommend Jojoba Oil, a plant based oil product that is non-toxic, odor-free and easy to use.